Students need to be personally involved in writing exercises in order to make the learning experience of lasting value. 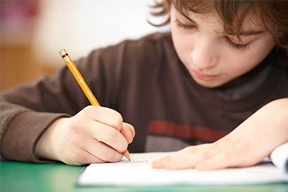 Encouraging student participation in the exercise, while at the same time refining and expanding writing skills, requires a certain pragmatic approach. The teacher should be clear on what skills he/she is trying to develop. Next, the teacher needs to decide on which means (or type of exercise) can facilitate learning of the target area. Once the target skill areas and means of implementation are defined, the teacher can then proceed to focus on what topic can be employed to ensure student participation. By pragmatically combing these objectives, the teacher can expect both enthusiasm and effective learning. Choosing the target area depends on many factors; what level are the students? What is the average age of the students, Why are the students learning English, Are there any specific future intentions for the writing (i.e. school tests or job application letters etc.). Other important questions to ask oneself are: What should the students be able to produce at the end of this exercise? (a well written letter, basic communication of ideas, etc.) What is the focus of the exercise? (structure, tense usage, creative writing). Once these factors are clear in the mind of the teacher, the teacher can begin to focus on how to involve the students in the activity thus promoting a positive, long-term learning experience. Having decided on the target area, the teacher can focus on the means to achieve this type of learning. As in correction, the teacher must choose the most appropriate manner for the specified writing area. If formal business letter English is required, it is of little use to employ a free expression type of exercise. Likewise, when working on descriptive language writing skills, a formal letter is equally out of place. With both the target area and means of production clear in the teacher's mind, the teacher can begin to consider how to involve the students by considering what type of activities are interesting to the students: Are they preparing for something specific such as a holiday or test?, Will they need any of the skills pragmatically? What has been effective in the past? A good way to approach this is by class feedback, or brainstorming sessions. By choosing a topic that involves the students the teacher is providing a context within which effective learning on the target area can be undertaken. Finally, the question of which type of correction will facilitate a useful writing exercise is of utmost importance. Here the teacher needs to once again think about the overall target area of the exercise. If there is an immediate task at hand, such as taking a test, perhaps teacher-guided correction is the most effective solution. However, if the task were more general (for example developing informal letter writing skills), maybe the best approach would be to have the students work in groups thereby learning from each other. Most importantly, by choosing the correct means of correction the teacher can encourage rather discourage students.